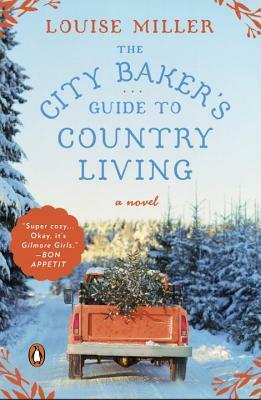 Goodreads: When Olivia Rawlings—baker extraordinaire for an exclusive Boston dinner club—sets not just her flambéed dessert but the entire building alight, she takes a much-needed weekend break in the idyllic leafy town of Guthrie, Vermont. A weekend soon turns into something more permanent when Margaret Hurley, the cantankerous, sweater-set-wearing owner of the Sugar Maple Inn, needs to recruit a new baker who can help her reclaim the inn’s blue ribbon status at the annual county fair apple pie contest. On paper, at least, Livvy seems to be just who she was looking for. Livvy’s love life’s a mess and so she does what she does best: relocate. Along with Salty, her gigantic, uberenthusuastic dog with almost too much personality, Livvy, as the Sugar Maple’s new baker, brings her mouthwatering desserts to the residents of Guthrie, home of Bag Balm, the country’s longest-running contra dance, and her best friend, Hannah. And when Olivia meets Martin McCracken, the Guthrie native who has returned from New York to nurse his ailing father, Livvy comes to understand that she may not be as alone in this world as she once thought. With the joys of a warm, fragrant kitchen, the sound of banjos and fiddles being tuned in a barn, and the crisp scent of the orchard just outside the front door, Olivia Rawlings may finally find that the life you want may not be the one you expected—it could be even better. Kritters Thoughts: Let me start by being superficial and say that I completely adored this cover. I don't usually comment on covers, but this one was just a joy to carry around and set the tone for the entire book. Olivia is a baker and in the beginning she is working at an exclusive club in the city of Boston. With a little drama at the club, it sends her to visit a friend in Vermont for the weekend and the weekend turns into so much more! A small town Inn calls on her to be their baker and the owner may have more than really good sweets to hire Olivia. And the story goes from there . . . I would define this book as a combination of women's fiction and romance. I say this because what I love about this combo is you don't know if there will be a happy ending like romance, but there is romance in this one. When women's fiction and romance get together there is more meat and plot and I just love it! I loved all the hills and valleys of this book. The ups and downs seemed so right and there wasn't one moment where I rolled my eyes or had one iota of frustration. I can't believe I hadn't read this book when it came out in hard cover, I am so glad I read it. When I was pitched the book, I was excited that they told me that they wanted me to include a promotion for her next book - YES! She has another one coming summer of 2018! And the publisher wanted me to let you know - Louise Miller's second novel, The Later Bloomer's Club, is forthcoming from Pamela Dorman Books/Viking. Disclosure of Material Connection: I received one copy of this book free of charge from Penguin Books. I was not required to write a positive review in exchange for receipt of the book; rather, the opinions expressed in this review are my own.